We live in a world of sounds, full of beautiful music, birds chirping, and the voices of our friends. It’s a rich cacophony, with blaring beeps, accented alarms, and knock-knock jokes. The sound of a door opening can alert us to a friend’s arrival, and a door slamming can alert us to an impending argument. 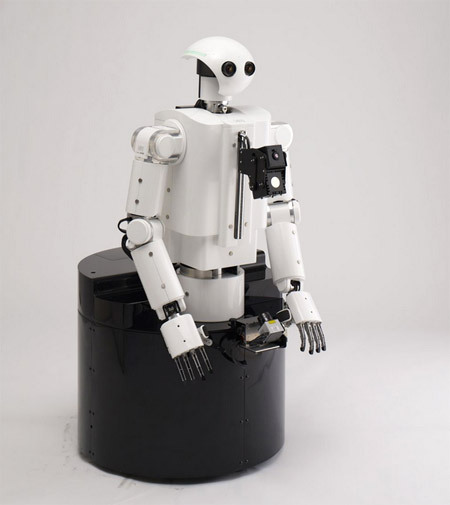 HEARBO (HEAR-ing roBOt) is a robot developed at Honda Research Institute–Japan (HRI-JP), and its job is to understand this world of sound, in a field called Computational Auditory Scene Analysis. At the IEEE International Conference on Intelligent Robots and Systems and RO-MAN this year, several papers describing HEARBO’s latest functionalities were introduced. With the dream of the futuristic robotic butler, researchers are trying to make robots understand our voice commands, a bit like Apple’s Siri but from 2 meters away. Typical approaches use a method called beamforming to “focus” on a sound, like a person speaking. The system then takes that sound, performs some noise reduction, and then tries to understand what the person is saying using automatic speech recognition.